Nestled among the forested hills of the Serra dos Órgãos is Petrópolis, also known as The Imperial City of Brazil. 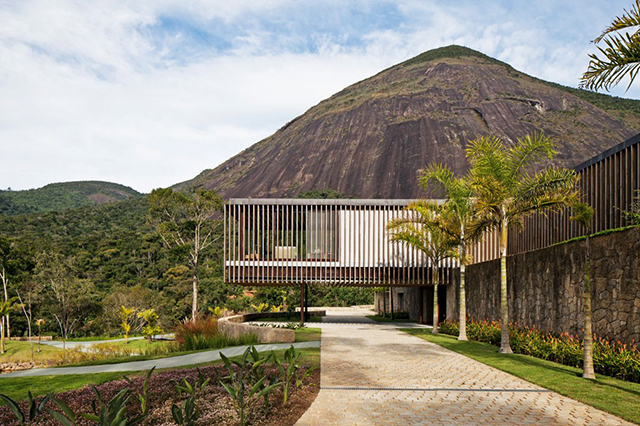 Petrópolis is a popular summer holiday spot amongst the locals of Rio de Janeiro, a perfect place for the clients of Jacobsen Arquitetura to build a new holiday home to have a place to spend their weekends and holidays with family and friends. 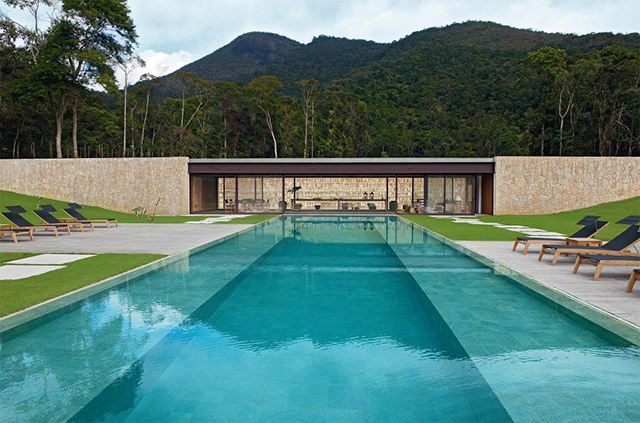 Because the couple planned on filling the house with frequent visitors, it was necessary for Paulo Jacobsen and Bernardo Jacobsen, founding architects of Jacobsen Arquitetura, create a program cautiously thought to create the perfect wellness and relaxation center. Perhaps the title of JN House is a bit too modest of a mantra. Many might refer to this build more of an estate than a "home", as the property features a main house, spa, swimming pool, pond, dog's room, tennis court, leisure pavilion, hydro massage room, gym, small warehouse, garage, office, home theater - to name a few. The architects took a topographical approach to develop to sculpt the land of what was to become the JN House. One concept behind the structure was to integrate architecture with nature, the elements that create the house were often hidden in the natural unevenness of the site, so there is mimicking with the land. Consequently, the construction was distributed through the land, being basically a single story house characterized by different independent blocks. Concrete structures and garden slabs bind into the topography and others subtly stand out through a mesh of wood in the landscape, created through a succession of structural frames. 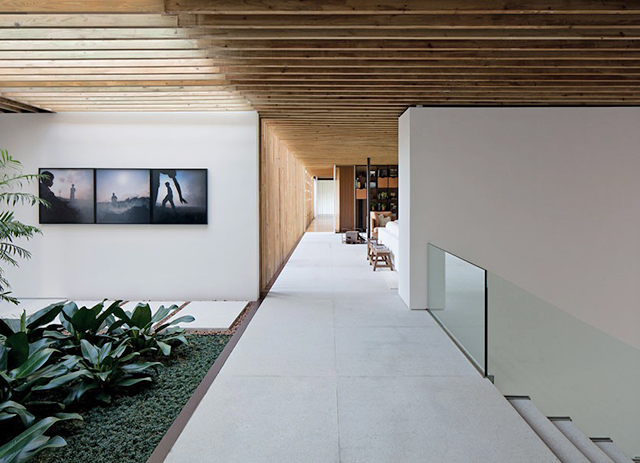 The access to the house is through a paved pathway leading to a suspended volume. This creates a front porch with a stunning view of the rocky mountains in the background. From a central core of the main house, you will find implanted on the land the SPA located by the pool, the children’s house, leisure pavilion with a tennis court and further away from the house the maids’ quarters. The main house has a linear floor plan. On the ground floor of this construction are the living and dining rooms, lavatory, pantry, four guest suites and a deck. The deck faces the pool and spa. The guest suites have bladed louvered panels closing. In the inferior part of the house is the garage, office, lavatory, service area and a home theater. 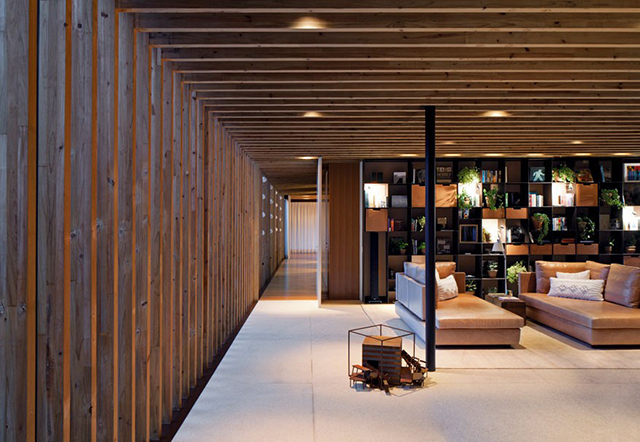 The garden slabs form a ceiling for some blocks of the house, so indoor comfort is maintained for visitors. The fireplace and interior gardens help regulate the temperature. The existence of large glass panels and skylights lets in natural light. The house generates different atmospheres depending on the brightness. By day the porticos create a game of exciting lights and shadow and at night the lights make the room cozy.